Certainly you have already thought about the purpose for which you need a new piece of clothing or how you would like to complement your wardrobe. Please bring your favorite clothes so I can get a first impression of your wearing habits. 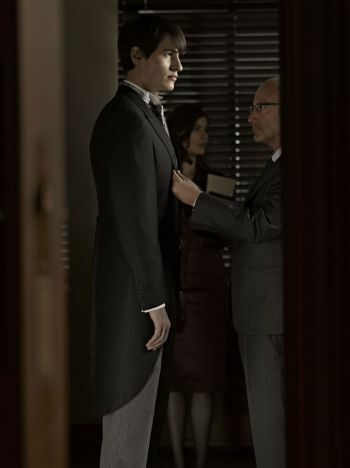 If you have no more detailed ideas, I will help you with advice and deed, and will show you how you can look at many new models, pictures and with the help of test pieces like your new tailor made garment. First of all, I determine your body measurements, body size, shoe size, etc. Based on these first findings, so-called “trial models” are used, with which a perfect shoulder and back course as well as the “balance” is defined. Details such as lap width, pocket height and pocket shape, as well as the model are discussed and set up in front of the mirror together. Whether you want a classic or a fashionable garment – I feel it is extremely important to work out the optimal proportion for you. My greatest concern is to take into account your individual physical conditions and, in particular, your personal preferences and to implement them in a perfect cut. For custom-made clothing, there is usually a correction test after approx. 4 weeks of preparation time. In our hand-made tailor-made line, however, at least three fittings are required; A so-called “raw sample” of the unfinished garment, which takes place approximately 14 days after cutting. On your first visit to my studio, you should take an hour. First, to get to know each other, to discuss your wishes and ideas, then to choose in resting materials and to determine your measurements. The model and the line layout as well as the numerous equipment possibilities are then defined.